Emili Castillo of Barcelona, Spain, recently launched this Penobscot 14 on the Fluvia River near his home. He named the boat SIBERIANA in honor of his son, who was born in Siberia, Russia, and his wife and daughter, who are both named Anna. 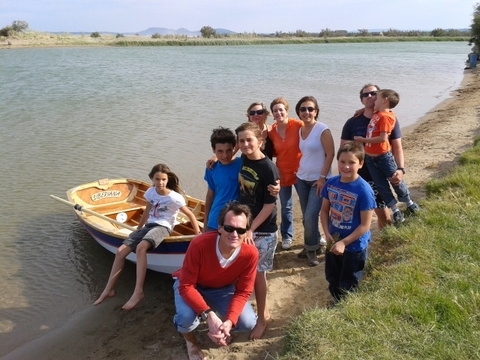 Emili, wearing the red shirt in front in the group photograph, reports that he is very happy with the boat and her performance under oars. Anna, Jr. is seen in the other photograph. 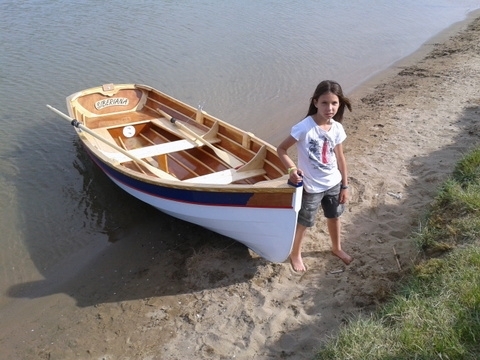 Emili plans to make the sailing rig next. Plans are available from Arch Davis at www.archdavisdesigns.com.